Prayer isn't some kind of requirement for believers. It is a privilege! Prayer is our path to the adventure of building a relationship with our Savior. Through prayer the Creator of everything stoops to hear the lisping of toddlers. The Sustainer of every living thing hears the groans and sighs of the aging. He is aware of every thought, every choice, every move we make---but He is waiting for us to turn to Him and tell Him about it. In this study readers will explore journaling prayers, prayer attitudes, and how to pray their way through a desert or a valley. They will get up close and personal in two-way conversations and learn how to survive---and yes, even enjoy---those times when they're put on the spot to pray out loud. They will learn how God answers even when they can't hear Him saying a thing and be reminded that they never grow so old they don't need to take time to say "thank you." 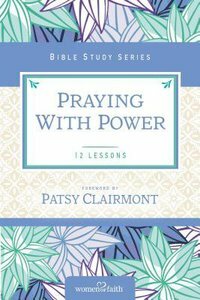 About "Praying With Power (Women Of Faith Study Guide Series)"
Patsy Clairmont comes from an uncommon background. Her years of suffering as a prisoner in her own home, a victim of agoraphobia, have given her a deep appreciation of God's healing power. God has pulled together the emotionally fragmented pieces of her life. From her emotionally troubled background God has combined her humor and her knowledge of His word to remind you that imperfect, "cracked" Christians are God's specialty.Patsy now travels throughout the U.S. providing humor for the heart and hope for the healing. Currently, she is a speaker with the Women of Faith conferences, speaking to tens of thousands of women each month. In her eleven years with Women of Faith she has reached over 3 million women. She has written best selling books cooperatively with the other Women of Faith speakers. The latest is Contagious Joy!Patsy is also the author of the best-selling books God Uses Cracked Pots, Normal is Just a Setting on Your Dryer, Under His Wings, Sportin' a 'Tude, Tea with Patsy Clairmont and Pillow Prayers. She also has written her first book of fiction, Stardust on My Pillow; Stories to Sleep on. Patsy is excited to now be a children's author! The Tales from the Pantry series contains five children's books Meatball, Soccer, Stinky, Spud and Basil and Parsley. Each one of these inspirational study guides delivers twelve weeks of Bible study, down-to-earth illustrations you can relate to, dozens of insights quoted from your favourite Women of Faith speakers and a complete Leader's Guide for easy group study.